Just a few quick thoughts before this weekend and fall break. It was great to visit with so many of you during the three “PYP coffee talks” over the past couple of weeks. I will schedule a second round of these after we return from fall break. My hope is to continue our curriculum discussions and deepen the understanding of just what we are all undertaking. On Friday you will have the opportunity to visit your child’s classroom. Your homeroom teachers will be unpacking the curriculum as well as facilitating a goal setting conference with you and your child. This is a wonderful time to look toward the future and collectively think about what your children would like to get out of this year’s experience. Our teachers put a great deal of thought and effort into the afternoon’s processes. It should be a rewarding experience for everyone involved. Our early learning center playground is finally completed and the younger children are all enthusiastically taking advantage of their new area. Thank you for your patience as we assembled and adjusted everything to fit just right. We owe a great deal of thanks to John Andrews and his maintenance crew for all their efforts. The results are remarkable. I will be traveling next week. If you have any questions or concerns please contact our Asst. Principal, Jody Rodine. Our Director will also be available to assist you in just about any capacity while I am away. Ok, That’s it for now. Have a wonderful fall break. Travel safe, and I will see you back here on the 16th. We have set aside Friday, September 29, 2017 for the elementary school Goal Sharing Conference. Elementary students (NOT the secondary school!) will have a half day of classes. You will be receiving your child(ren)'s schedule for the afternoon electronically next Tuesday. Please contact Emefa Atiase (emefaa@faculty.isd.sn) for any further information or questions. During the week of September 18th, your child will take a MAP® Growth™ test from NWEA® on a computer or tablet. We give students MAP Growth tests to determine their instructional level and to measure academic growth throughout the school year (and from year to year) in math and language arts (reading and writing). While second graders do not take this assessment at the start of the school year, they do take a short practice test so that they can become familiar with the computer adaptive format. Second graders do take the assessment one time at the end of the school year. MAP Growth tests are unique in that they adapt to your child’s level of learning. If your child answers a question correctly, the next question is more challenging. If they answer incorrectly, the next one is easier. This results in a detailed picture of what your child knows and is ready to learn—whether it is on, above, or below their grade level. The results of the MAP assessments in no way influence the marks students receive on their report cards. Since MAP Growth tests provide immediate and accurate information about your child’s learning, it’s easy for teachers to identify students with similar scores that are generally ready for instruction in similar skills and topics, and then plan instruction accordingly. MAP Growth reports also provide typical growth data for students who are in the same grade, subject, and have the same starting performance level. Each school year, students in grades three through five take the tests at the start, the middle, and the end of the school year. Following each testing period, you will receive a report showing your child’s growth, which you can review with your child’s teacher for more insight. We are truly excited to focus on your child’s individual growth and achievement. For more information about the MAP Growth test, visit: NWEA.org/Parent-Toolkit. It was wonderful to see so many of you at Open House on Wednesday evening. Our year is off to a great start. Its stunning to witness all that goes on at our school to generate and nurture community! Our elementary school’s path toward becoming an authorized IB World School is just one example of how we are looking ahead and preparing our students for the future. According to Pink, these forces are catapulting us out of the Information Age into the Conceptual Age. It is a compelling argument and those of us in education need to consider how our practices should evolve in order to satisfy the demands of such a future. The IB’s Primary Years Program addresses Pink’s predictions – and indeed, other possible futures as well! - through its curricular framework. Last week we discussed the value of obtaining knowledge with a transdisciplinary approach. This week I would like to explore the second of the five essential elements; CONCEPTS. Our new curricular framework is founded in purposeful, structured inquiry. We want to provide students with engaging and significant ideas to drive the inquiry process. These ideas are referred to as “key” concepts, or key questions. These help teachers and students consider different ways of thinking and learning about the world. They also act as provocations to extend and deepen student inquiries. Form - What is it? Function - How does it work? Causation - Why does it work that way? Change - How has it changed over time? Connection - How does it affect other things? Perspective - What are the different points of view? Responsibility- How can we take action? Reflection - How do we know we understand? These concepts are central to the PYP curriculum. Along with their key questions they shape our units of inquiry, giving them purpose and direction. If explored systematically and thoroughly, the concepts can liberate thinking, suggesting a range of further questions and deepening lines of inquiry. Importantly, these concepts do not limit the breadth of a student’s knowledge and thus are accessible to children of all aptitudes. Teachers will include all eight concepts in each unit of inquiry, but each unit of inquiry will specifically address two or three key concepts. By the end of the year, students will have had the opportunity to explore all eight key concepts. You can see that these lines of inquiry are open-ended and accessible to different sophistication levels, so each student can explore them at their own level, while still pushing themselves to think "bigger" and differently. Through classroom work and discussion, students will connect new understanding to the central idea, and this will in turn help them develop their own perspective on the overarching themes. How would we assess the success of this approach? It’s not as subjective as you might think: by the end of the unit, students will be able to articulate their connection to and opinions about the central idea, and give evidence for their point of view based in the unit's learning experiences. Whew! It seems like I took the long way round to simply say we want our students to think big, think deep and think outside the proverbial box. In fact our approach creates possibility: maybe students will create their own, better box! Now let’s go back to Daniel Pink’s concept-driven future. Look back at his six predictions for the needs of the future workforce: you can connect each one to the design of our units of exploration. I would love to discuss these ideas further with anyone of you who are interested. I know that my articles can seem quite dense, so sometimes a face to face chat is more illuminating. With that in mind, I have set Saturday morning September 16th aside for an informal coffee and discussion of the program. We will convene in the conference room at 9:00 am. We can spend about 90 minutes clarifying and inquiring into our school’s path. ISD is an IBPYP Candidate School: How Do We Impart Knowledge? Happy Thursday, everyone! There's a lot to talk about today. I want to show you how PYP's curriculum design engages the whole student, teaching breadth, depth, and complexity at every age. Let's dive in! Last week we discussed the five essential elements of the Primary Years Program (PYP) with regards to the written curriculum. The five elements of the PYP written curriculum are: concepts, knowledge, transdisciplinary skills, attitudes and action. This week I want to deconstruct the philosophy behind one of the “essential five”: Knowledge. Due to the unique challenges faced by schools implementing an international education program, it is important that the PYP curriculum model includes a framework for a coherent, flexible, and conceptual body of knowledge. The framework needs to support our school’s mission and vision as well as the IB’s Learner Profile. Exploring certain areas of knowledge is essential to achieving our primary outcome: international mindedness. Traditional subject areas are important and indeed are specified as components of the the PYP curriculum model. However, simply educating students in a set of isolated subject areas tends to diminish the significance and complexity of understanding required for students to make connections across disciplines and evaluate their experiences. Ultimately, students are less able to apply their learning in real life. and responsibilities; what it means to be human. interconnectedness of individuals and civilizations, from local and global perspectives. the impact of scientific and technological advances on society and on the environment. them; access to equal opportunities; peace and conflict resolution. Engaging- involving students in a constructivist approach to understanding. Relevant - Linked to prior knowledge and experiences. Thus connected to the students’ lives. Challenging - increasing and extending students’ competencies and understandings. Significant - contributing to the recognition of the transdisciplinarity of an idea and connecting to the commonality of human experience. For example, pre-kindergarten students might have a unit titled "Our School." The transdisciplinary theme that this unit communicates is "how we organize ourselves" and the central idea is that schools are organized to help us learn and play. The entire unit is an inquiry into what a school is, what we do in school, how our school works, and who works in the school doing what sorts of jobs. Later, in 5th grade, 10 and 11 year olds might have a unit titled "All You Touch and All You See." The theme is "Who we are" and the central idea is that "memory influences perspective." 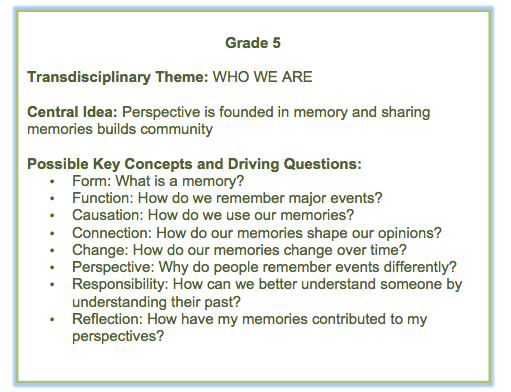 This unit teaches students how to think about the past's effect on the present, the nature of memories, different points of view when remembering a single event, and individual vs collective memory. So as you can see, the structure of the PYP curriculum communicates breadth and depth at an age-appropriate level, and is flexible to give students new ways to think about traditional subjects. In sum, the transdisciplinary themes help teachers provide highly defined, focused, and in-depth explorations. The guidelines for unit design eliminate redundancy and avoid the pitfalls of rigor without reflection. Importantly, unit design is a collaborative effort on the part of grade level and/or specialist teams, so the program should enrich and transcend the talents of any individual teacher. Next week we will look at the conceptual nature of the program and attempt to connect what we want students to know with what we want students to understand. Have a great long weekend. I look forward to seeing all of you at Open House on Wednesday, September 6th! Last week we discussed our school’s journey toward becoming an authorized International Baccalaureate Primary Years Program (IBPYP) practitioner. We looked at our school’s current mission and vision and compared such to the IB Learner Profile. Remember that the ten attributes of the Learner Profile are outcomes and represent what we hope will comprise our students’ personal make-up at the end of their tenure here. If internationally minded, globally competent children who exhibit the attributes of the IB Learner Profile is the outcome, then the next natural question is: what processes will help us get there? This brings us to the written curriculum. In the Primary Years Program we seek a balance among the acquisition of essential knowledge; the development of transdisciplinary skills and conceptual understanding; the demonstration of positive attitudes; and taking responsible, thoughtful action. The diagram below outlines and provides brief descriptions for each element. KNOWLEDGE: Significant, relevant, content that we wish our students to explore and know about. Takes into consideration their own prior experiences and connecting to their previous understandings. CONCEPTS: Powerful ideas that have relevance within subject areas, but also transcend them. Students must explore these ideas in a gradually increased sophistication of understanding in order to construct in depth connections. SKILLS: Capabilities that students need to demonstrate to succeed in a changing, challenging world. ATTITUDES: Dispositions that are expressions of fundamental values, beliefs and feelings regarding learning, the environment and people. ACTION: Demonstrations of applied learning through responsible behavior and thoughtful actions. These are synthesized manifestations of the other four essential elements. As educators incorporating these five elements into the curriculum, we are guided by six transdisciplinary themes. These six themes appear in the Knowledge column of the diagram above. Next week: the transdisciplinary themes, how they are explored, their make-up, and how they contribute to a comprehensive program of inquiry. Have a great weekend and remember I am always available to answer any questions you may have. ISD is an IBPYP Candidate School! What does that mean? Welcome back to what should prove to be a truly phenomenal year for our learning community. On June 15th, ISD was granted approval to explore and pursue becoming an authorized practitioner of the International Baccalaureate Primary Years Program (IBPYP). We are excited to begin this shift in our curricular paradigm that will result in ISD becoming an IB World School. There are many components to this process, including curricular design, assessment practices, and character education. These all synthesize to attain an overarching educational goal: an internationally minded, globally competent, lifelong learner. Over the next few weeks, I will use this forum to discuss the ideas and actions our school will undertake as we align our practices with the IB. The first aspect of the IBPYP to understand is the the IB Learner Profile. The learner profile is essentially the IB mission statement translated into a set of learning outcomes for the 21st century. The Learner Profile adds specifics to this broad mission. It expresses the values inherent to the IB continuum of international education. These are the values we strive to instill in our students, and these are the values that infuse all elements of the IBPYP. Knowledgeable. They explore concepts, ideas and issues that have local and global significance. In so doing, they acquire in-depth knowledge and develop understanding across a broad and balanced range of disciplines. Thinkers. They exercise initiative in applying thinking skills critically and creatively to recognize and approach complex problems, and make reasoned, ethical decisions. Principled. They act with integrity and honesty, with a strong sense of fairness, justice and respect for the dignity of the individual, groups and communities. They take responsibility for their own actions and the consequences that accompany them. Open-minded. They understand and appreciate their own cultures and personal histories, and are open to the perspectives, values and traditions of other individuals and communities. They are accustomed to seeking and evaluating a range of points of view, and are willing to grow from the experience. Caring. They show empathy, compassion and respect towards the needs and feelings of others. They have a personal commitment to service, and act to make a positive difference to the lives of others and to the environment. Risk-takers. They approach unfamiliar situations and uncertainty with courage and forethought, and have the independence of spirit to explore new roles, ideas and strategies. They are brave and articulate in defending their beliefs. These ten attributes support and underpin the ISD CORE values and will eventually permeate our curricular design and implementation. They are our reference point and will become our benchmark for effectiveness as we align ourselves with the standards and practices of the IBPYP. I plan on hosting a couple of informative PYP parent nights as our year unfolds to inform and engage as many of you as possible. Take care, rock on, and have a great week! Welcome to the new school year! I hope you are all looking forward to a great year at ISD. The staff is well rested and looking forward to working with your children. We are thrilled to be welcoming several new dynamic teachers to our already amazing faculty. I am so excited for you and your children. However, due to some recent health issues, I will not be able to join you at the start of the school year. There is nothing I would like more than to be there with all of you during those first exciting weeks of school. I am extremely grateful for the wonderful medical treatment I am receiving and I look forward to returning to ISD soon. In the meantime, be assured that the ISD community is doing everything possible to make sure that our elementary students get off to a great start. Brad Chumrau will be serving as the acting elementary principal in my absence. He will also remain in his current role as the PYP coordinator. Jody Rodine will be serving as the elementary vice principal and continue to teach elementary learning support part-time. With Brad and Jody in these roles, the Elementary School will have consistent strong leadership throughout the school year, and ISD will move forward with PYP implementation and a strong learning support program. I know without a doubt that everyone at ISD is working to make sure that your children are actively and happily engaged in their learning and activities. Your children are in very good hands! I wish you the very best as we begin the 2017-18 school year and look forward to joining you again soon! The ISD community extends our best wishes to Kelly for a full, speedy recovery. We will miss her energy and enthusiasm as the year begins, and we eagerly anticipate her return to ISD. If you have any questions about the transition, please feel free to contact Alan Knobloch at alank@faculty.isd.sn or 766-44-6028.
posted Jun 5, 2017, 4:00 AM by Kelly ‎(ES Pr)‎ CHUMRAU. Please make sure that you have arranged for lunches for your kiddos during Summer Camp. If you plan on having your child eat lunch here, you need to make sure you have ordered with Shady! posted Jun 1, 2017, 12:33 PM by Kelly ‎(ES Pr)‎ CHUMRAU. Please join us in the PAC. ISD is officially a PYP Candidate School! Hooray!!! Becoming a PYP Candidate School is a great honor. Our school has been approved by the International Baccalaureate Organization to begin candidacy. That means we are going to begin practicing some of the PYP practices. We are going to begin implementing some of the PYP routines. Our teachers will be trained in how to “do” the PYP. Your children will benefit from the innovative and creative PYP lessons. You will be invited to learn more about the PYP throughout the school year at a series of parent informational meetings. Please continue to follow this Jag Journal for continual updates next school year. Click here to here PYP students talk about their learning! Click here to learn more about the PYP. And for your summer reading…. Read Africa - invites young people to read great books on Africa . Sankofa Reads - focuses on chapter books. CABA Reads - lists winners of the Children's Africana Book Awards. Parents of Current 5th graders… Soon to be 6th graders….. The Middle School Orientation for all new MS students will be on Wednesday, August 9th from 1:00 – 2:30 PM. Students will meet in the Performing Arts Classroom (PAC). They will connect with other students who are new to the middle school. This includes ISD students who were in grade 5 for the 2016-17 school year. We will play some get to know you games, take a school tour, meet teachers, and answer questions. The entire middle school staff will be ready to welcome your adolescent. To ensure your son or daughter gets the most from this experience, please make sure your son or daughter is dropped off and picked up at the times listed above. If you have any questions, please email me at EileenK@faculty.isd.sn. Even though students are on break during the summer- they should continue to read at least for 30 minutes or more daily so that the can hold onto the gains they've made over the course of this academic year. The last day of school is June 7th. At this time students will receive report cards and yearbooks. Please make arrangements for pick up at 12pm. Please make sure students do not have overdue books/fines or balances (you can check with Francois the cashier) as students will not be able to receive their report cards if this is the case. Way to go Animal Rescue League! Thank you to John A., Eric, JulieAnne, Deanne, Brad B., Nancy, Axelle, Pam, Andrew, Toni, Wendy, Arnaud, Lisa, Friederike, Eva and so, so many parents ! None of this would have been possible without the help and collaboration of such valuable members. It’s been a fabulous year! Thank you all for taking time to read our Jag Journal. Good-bye dear friends and to those who are returning, see you in August!